The starting point is near Urke at the north side of Norangsfjorden, the innermost part of Hjørundfjorden. Access is by the fairly infrequently running ferry from Sæbø to Leknes, then 1.9 kilometer to the road signed Urkedalen. Alternatively, drive from the intersection between E-39 (just south of Kvivstunnelen) in Grodås and Hwy. 60 signed for Stranda about 20.5 kilometer, then turn left onto Hwy. 655 and continue about 24 more kilometer. Locate the small road going right signed for Urkedalen. Drive this small road 2.7 kilometer. The trailhead is signed on the left hand side in a right curve on the road. There is parking off the road for 1-2 cars about 50 meter further uphill on the right hand side. Park here, location N62.23196, E006.58688, elevation about 230 meter. About 1.2 kilometer along this road, there is a gate and (often) many goats on the upper side. Make sure that the gate is closed properly and that all goats stay where they should. This road is paved in the beginning, then a good dirt road higher up. Follow the trail up (north) the valley from the "Råna" sign posted next to the road. There is a good and quite easy to follow trail. 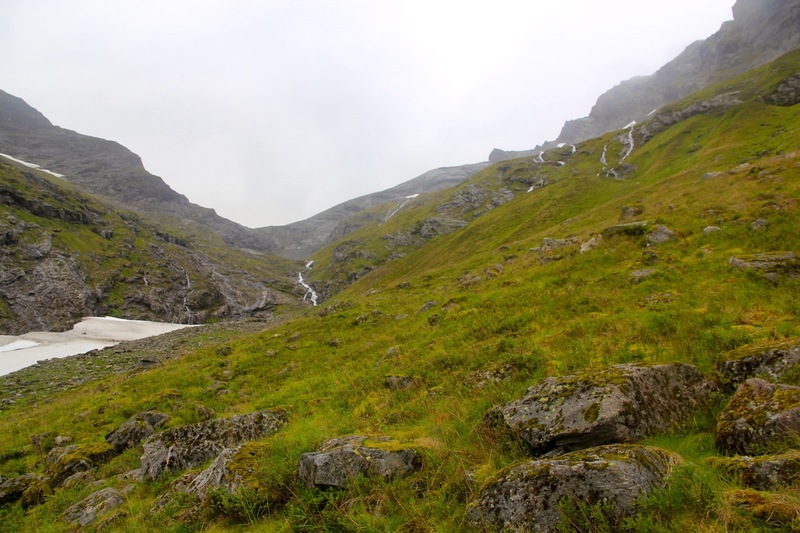 After about 1.2 kilometer, you arrive at the fork with Nordkopen valley going left and Grøtdalen curving more right. The route must cross the river coming from Grøtdalen near this point. Early in summer there may be good snow bridges here. 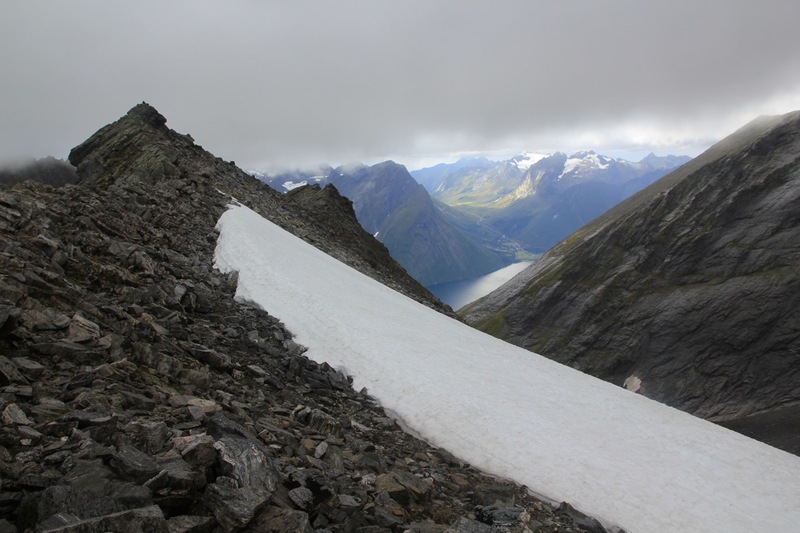 In fact, it looks like there is often a big snow bridge just slightly further up the Grøtdalen valley (about 100 meter). Otherwise, the best crossing is likely to be just above the point where the two rivers meet. If there has been recent heavy rain, then this crossing should be done with care and attention to safety. The trail continues on the other side running up the lower part of Nordkopen sort of parallel to the main river in the lowest part of the valley. 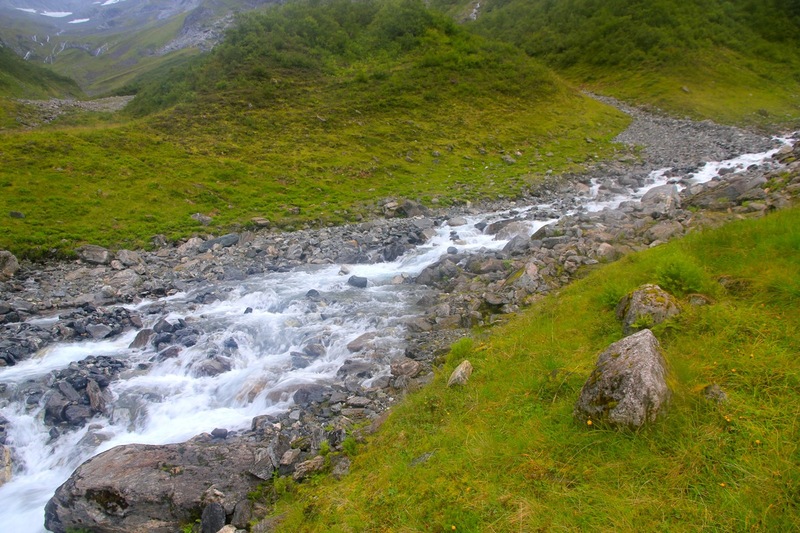 The trail will cross 3 distinct, but small gullies that drains part of the terrain on the right (north) side. Arriving at a steeper step in the valley between elevation 700 and 800 (roughly), the trail possibly continues uphill next to the river. (When I was there on August 19., a big patch of snow covered the trail, it looked extremely unattractive to move any closer to the river.) 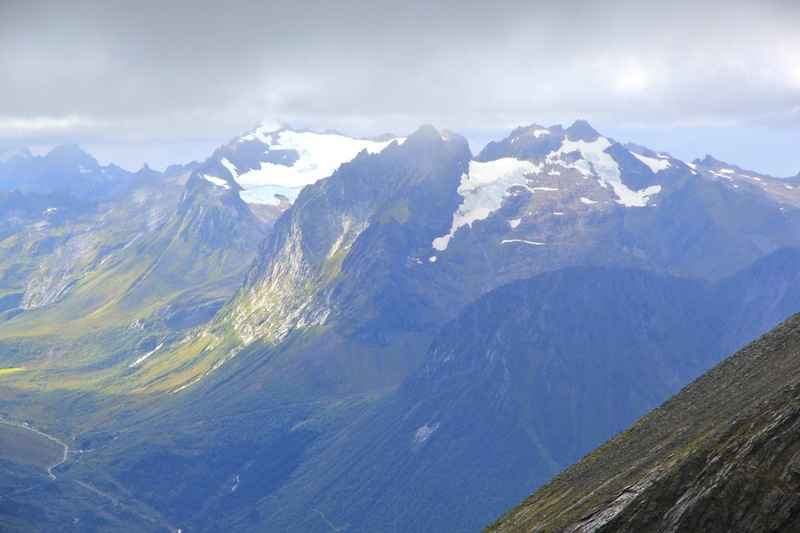 Alternatively, one may climb the steepish grass in several places, the best is possibly to move further right and follow a distinct ridge (moraine) uphill. When reaching about 800 meter, traverse left and follow what is a quite natural line that connects back into the very bottom of the valley. Either way, continue up the middle of the valley on scree and talus, you will spot a red "T" marker and then see that more red markers move left, in order to follow a pretty obvious line that extends up the steeper rock to the very top, reaching the col between Elsandtindane (1398) on the south (left) side of the col and the west ridge that extends down from Regndalstindan (1540) (right), more north-east. This stretch is by far the most difficult if the rock is wet and slippery. The same section is likely quite straightforward YDS class 2+ when the rock is dry. One may then walk with reasonable friction and touch the more vertical rock immediately on the left whenever appropriate. From the col, the route continues uphill along a wide hill (lots of rocks), this is quite easy class 2 terrain. Higher up, the ridge narrows and there is a short section with more smooth rock sloping right, the left hand side is vertical. One may walk across this when the rock is dry, during wet conditions this area may also be quite slippery and care should be exercised. There are good cracks in the rock that may be used to cross with extra safety in case of unfavorable conditions. Right ahead, there is a vertical rock (not very high) that blocks access. However, this obstacle can be passed without any technical problems on the left side. This passage has good, flat spots for placing your feet and also good hand holds on the right hand side. Thus, the only issue here is exposure, you walk near the edge of a big drop. 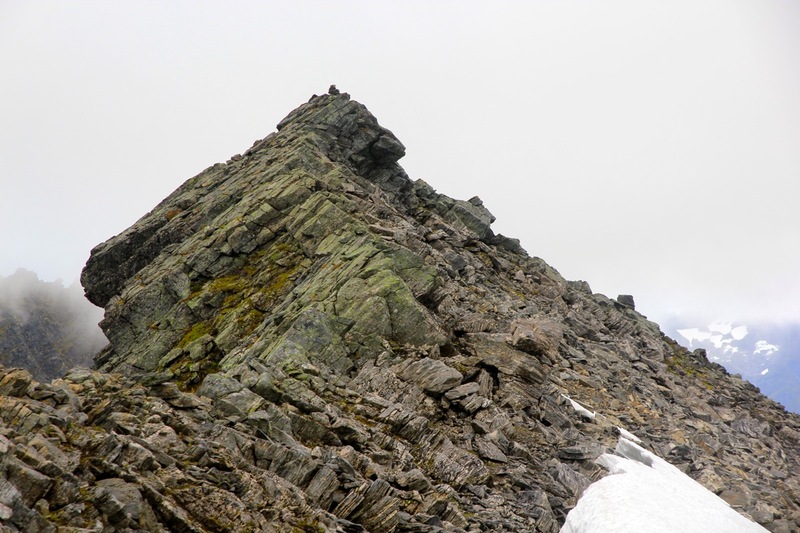 After this point, the ridge is wider and quite easy to follow until it connects with the general north-west face of Regndalstindan. 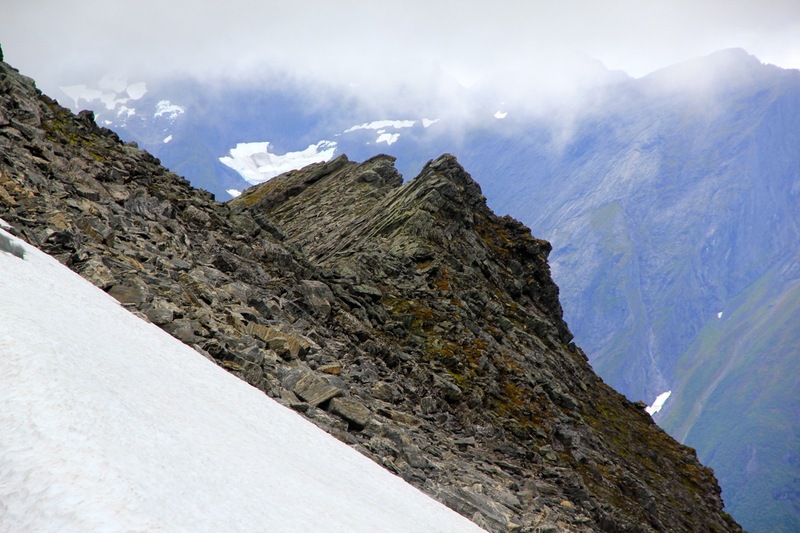 Traverse directly towards the col that ends the north ridge of Regndalstindan. There may be a patch of snow here, in mid August, the route crossed above this snow. Earlier in the season, it may be appropriate to bring crampons and an ice axe. From the col north of Regndalstindan, the ridge is broad and almost flat, gradually getting a bit steeper as you get closer to the summit. Stay right, since the summit is located at the far right side of the ridge. At the summit, you will observe 3 additional points forming a short, but jagged (north)east ridge. The exact relative elevation of these 4 points are currently a bit unknown with few and partially conflicting measurements. I will add more info here as it becomes available. This climb turned out to be a much longer and somewhat rougher trip than foreseen. I left from Arnt (at Gurskøya) around 0745 and drove south to Hornindal, then across to Norangsdalen and down to the small community Urke. I parked just beyond the trailhead (signed) and was ready to hike by 1000. Unfortunately, the clouds were pretty low and it was raining. Quite a bit worse than the forecast. I followed the good trail for a bit more than a kilometer and became aware of the first significant problem. 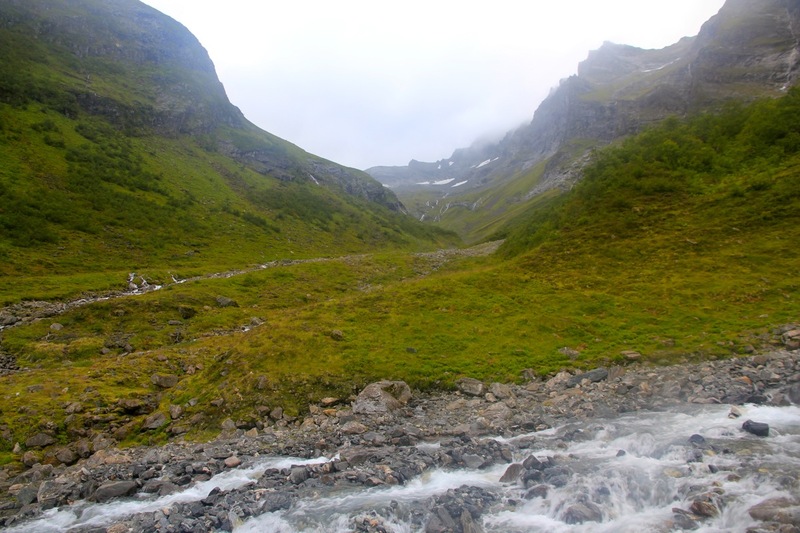 I obviously needed to cross the river coming from Grøtdalen in order to continue up the Nordkopen valley. It had been raining for several days and the river looked big and unfriendly. I spotted a huge snow bank about 100 hundred meter upstream and headed that way in order to investigate if a safe snow bridge existed. No such luck, the snow bank was at least 4 meter thick and most of the river flowed under it, however, there was a big crevasse like crack that most likely would be dangerous to cross without a belay. I returned to a spot just above the fork in the river and tested a crossing here. This was actually easier than it looked, but water would run almost to my knees and feet and socks/boots were soaking wet by the time I was across on the other side. The trail now continued up Nordkopen to about 700 meter of elevation where a big patch of snow covered the trail completely. I could not see any sign of a trail on the other side. In fact, moving any nearer to the river looked very dangerous. The river had made a huge hole in the snow and a big cave underneath. Clearly, one should not walk on top of this snow anywhere near the river. I considered my options and decided that straight uphill might be as good as anywhere else. I found a reasonable line and ascended about 100 vertical meter on steep grass before reaching a more level, gently sloping area. However, here I made a mistake. With limited visibility, I decided top ascend about another 100 vertical meter, then traverse across and hopefully gain the ridge. The terrain was pretty easy and I quickly gained another 100 meter. 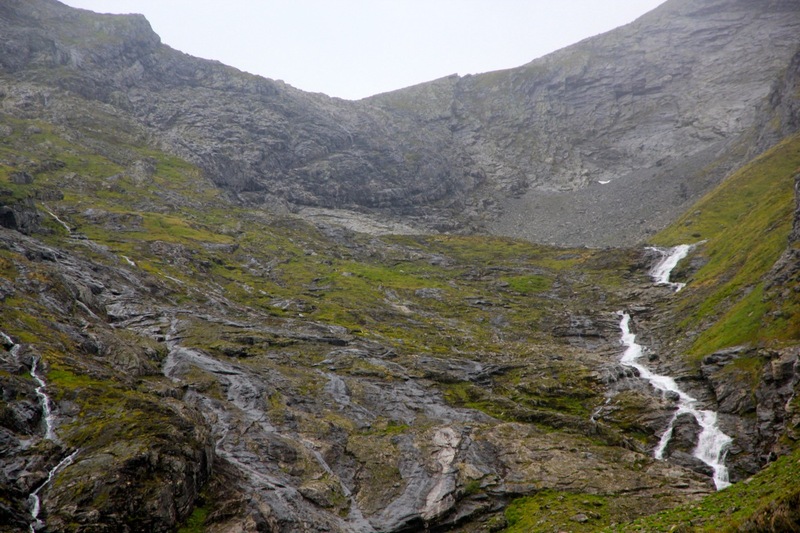 According to my map, I was still almost 100 meter below the col, so a traverse across there should work. The ridge was beyond view due to fog, but when I finally got close enough to see it, I realized that there was no easy traverse. In fact, the only option seemed to be a rather steep descent back down to the valley floor. There were cliffs below me, but more (steep) grass on my far left. I started a slow and careful descent hoping that I would not "cliff out" further down forcing me to ascend back up. With some effort I got safely down and realized that this detour had taken quite a lot of (extra) time. Unfortunately, the difficulties were not over yet. I now found a red "T" marked route leading up slabs of rock. Water came down everywhere and there were spots with moss and lichen that the water made super slick. Climbing solo means an extra level of safety everywhere and this slowed me down considerably. I disliked this terrain more than a little. Slowly, with several alternative variants to explore, I eventually gained the col. A lot more time had certainly elapsed. The ridge itself proved very easy. Careful movements across the few meter of slabs just before the small vertical step. The route around this step on the left was exposed, but very easy even with completely wet surfaces in the rain. No climbing is required, this is just a point with exposure to the left side. The rest of the ridge was wide and easy, the subsequent traverse across the slope from Regndalstindan was similarly easier than it looked from a distance. I made good progress and finally arrived at the summit. I looked at my watch for the first time since leaving the car and "knew" that it would be late. Boy!, almost 1530, meaning that the ascent (with detours) had taken about 5.5 hours. It would be late before I would return to Arnt, including at least 1.5 hours of driving. My original plan had called for investigating at least 2 of the 3 additional subsummits, then also visit Regndalstindan. However, I was really already passed a reasonable turn-around time. 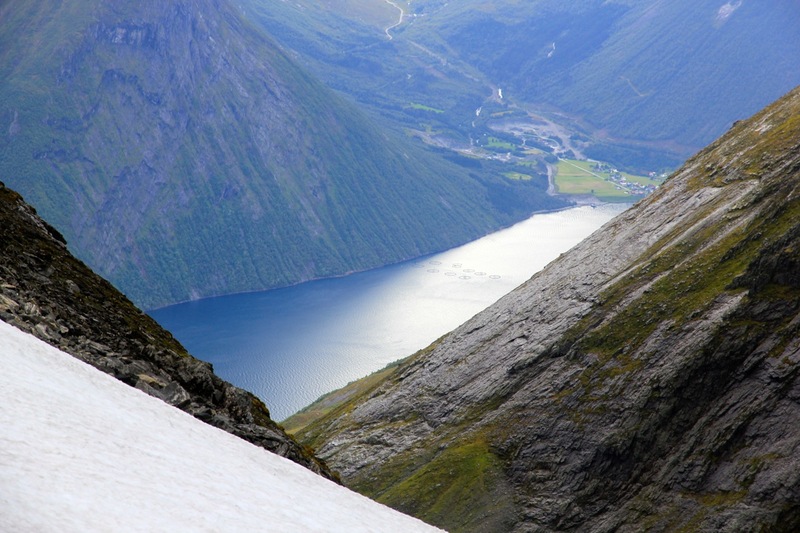 I still had those slippery slabs to descend and find a better route back down Nordkopen. Consequently, all plans for any additional adventure were cancelled and I started my return around 1535. Before returning, I measured the elevation by my GPS sampling about 10 minutes. I also tried to find a level line of sight across the top summit rock and over to the next two summits. 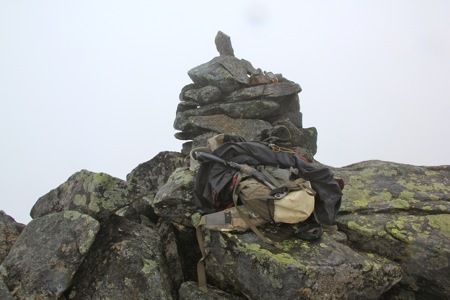 It appeared that summit number 3 was (slightly) lower than summit number 2. 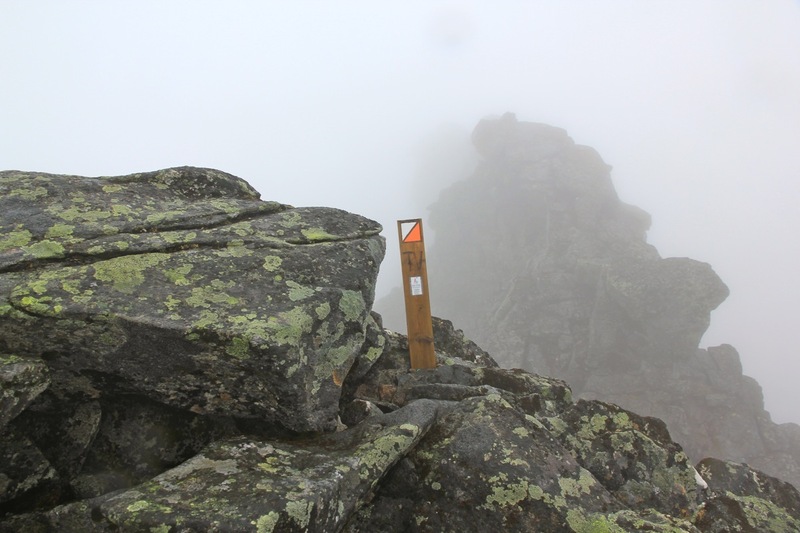 Summit number 4 was really difficult to see well due to fog/clouds. My summit and summit number 2 appeared quite equal. I formed a vague theory (wishful thinking?) that summit number 2 might be slightly lower since summit number 3 was pretty clearly visible across summit 2 when observed by me standing, while it rapidly became lower as I lowered my line of sight to the level of summit number 1. The return hike went pretty much smoothly. Easy back to the col, careful and more slowly down the slippery slabs. I remembered many details from my ascent, helping to make the descent a bit more efficient. I then hiked a bit down the valley before traversing out left on the grass above its steeper section. I headed all the way across and descended to a moraine ridge that carried me down to the trail. The final river crossing went ok and I was back at my car by 1900. Driving back to Arnt (there was no convenient ferry at Leknes), where I was welcomed with a nice dinner and a couple of beers. View down Litledalen, to Hjørundfjorden.